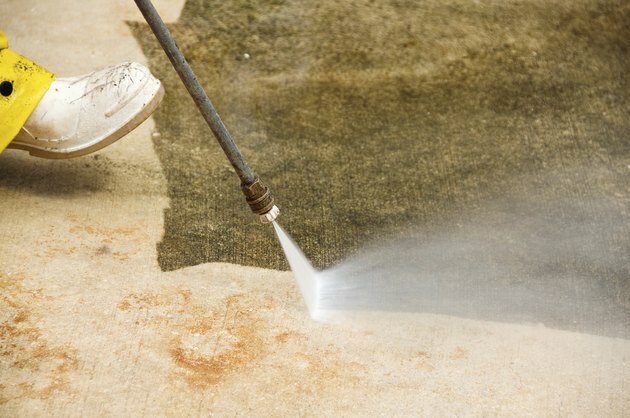 If your Troy-Bilt pressure washer is performing poorly, troubleshoot the machine to diagnose problems before you hand it over to a professional repair service. According to Troy-Bilt, most problems can be separated into three groups: those related to the pump and pressure, those associated with the mixture of detergent and those related to the engine and power. A pressure washer cleaning pavement. Replace the low-pressure spray tip with a high-pressure spray tip. The spray tip screws off in a counterclockwise direction. Check the water inlet for blockages and clear the inlet if you discover blockages. Scrape large blockages away. Spray compressed air in short bursts to clear out smaller debris. Check the inlet hose and verify that the unit is receiving adequate water flow. Straighten the inlet hose if it is kinked. Also verify that the water supply is not hotter than 100 degrees Fahrenheit. Water temperatures this high will cause the pressure washer to perform poorly. Check and clean the inlet hose screen. The screen is located on the pump's water inlet. Blockages at this location affect the pump's pressure. Check the spray gun for leaks and replace the gun, if necessary. Pay particular attention to the location where the gun connects to the hose. Press the red button on the gun and verify that the trigger springs back to its resting position. If it does not, replace the spray gun. Verify that the detergent siphoning tube is submerged in the detergent far enough to submerge the end of the tube. Check the siphoning tube for clogs and cracks, and replace it according to the manufacturer's instructions, if necessary. Replace the low-pressure tip on the spray run with a high-pressure version. Verify that the detergent ball has not become lodged in the siphoning system. To do this, turn off the unit, squeeze the trigger on the spray gun to release any built-up pressure, remove the siphoning hose from the barbed fitting on the pump and insert a thin object such as an Allen wrench into the barbed fitting until you feel resistance. Apply slight pressure until you feel the ball come loose. Reinsert the siphoning hose into the barbed fitting. Verify that the engine rocker switch is set to the "On" position. The switch is located on the side of the unit. Verify that there is sufficient gasoline in the pressure washer and fill it up, if necessary. Check the oil level in the pressure washer and fill it to the indicated level, if necessary. The oil dipstick is located on the top of the unit near the air intake. You will need to change your oil more frequently if you are using your Troy-Bilt pressure washer in excessively dirty conditions. Check the air filter for dirt and debris and replace it, if necessary. To check the air filter, slide the cleaner lever on the filter housing to the "Unlock" position and tilt the filter cover down. Verify that the spark plug wire is firmly connected to the spark plug.